San Luis Obispo is working to replace 400 parking meters with new units that will also take credit cards while charging $1.50 an hour for parking, an increase of 25 cents an hour. Last year, the City Council approved the rate increase and cost of replacing the meters, about $220,000, as a revenue source for the city. The 400 meters are to be located in the highest parking use areas of the city’s downtown. Proponents of the new meters contend the increase cost will motivate visitors to park in the city’s parking garages. During the same meeting, city officials also voted to begin charging for parking on Sundays from 1 p.m. To 6 p.m., to be enacted later in the year. The two increases are slated to help increase revenue needed to help fund a $20 million structure to be built on the corner of Palm and Nipomo streets. Just wait. The next meter upgrade will take pink slips. 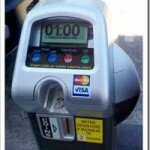 “Proponents of the new meters contend the increase cost will motivate visitors to park in the city’s parking garages”. Just another reason NOT to patornize downtown at all. I haven’t found anything in SLO downtown that I can’t find in shopping centers where parking is FREE! It’s a moneypit for the city. I ask, where is the encouragement to even shop in downtown SLO? Certainly being greeted with a parking meter and/or a meter maid makes me want to run the other way. I’ll have to rethink my original comment. I didn’t realize SLO downtown had such charm. As soon as I gather my flak jacket and attack dog, I’ll head downtown. Let’s soak John Q. Public eveywhere he goes – at the pump, in the store, out of the store. Bill Denneen – you must be smiling! SO, the cost to replace perfectly fine , working meters with these newfangled contraptions is $220,000. Recovery time …the time when these are so-called ‘paid for’ at $1.50/hour is 146,666.66 hours …= 6,111 days …= 16.74 YEARS. Oh yeah, there are 400 of them. On the other hand, there are less than twelve hours in a day when these parking rates apply. As is often the case, this appears to be a ‘new toy’ that proved irresistable to a few decision makers. 400 meters at $1.50 per hour for 8 hours a day = $4800 revenue generated per day. $220,000 divided by $4800 = 46.25 days to generate $220,000. I also acknowledge that not ALL meters will be bringing in money everyday 8 hours straight. And I do wonder just how SECURE your credit/debit card data is? Really want to increase the coffers? Then start enforcing the no-smoking ordinance and keep increasing the fine for repeat offenders. When are they going to repair the streets in SLO? And what are they going to increase next to do so? I wish I lived in a town that’s so bitchen I had to pay to patronize its vendors. Yeah, SLO is so bitchen that I don’t bother going there anymore unless I absolutely have to. I don’t shop in the downtown district at all or patronize any of their downtown restaurants either. Between the parking meters and all the cars confined in that small area is very unhealthy. I have to laugh that they band smoking when the car fumes are 100 times more toxic. It is somewhat ironic that the healthiest place in America (Central Coast) makes its living off others traveling here by means of smog spewing machines. As far as the unhealthy air down town It reminds me of one of the places i previously lived where on any given day I watched exhibitionists jog down the beautifully manicured median grass strips that were bound by total gridlock of vehicles two lanes wide on either side…but they.they looked cool, Gotta love Beverly hills..
SLO used to be “bitchen”, 20 or 30 years ago. I avoid it now if I can. Downtown is a hassle, now even more so. Why would anyone want to pay the highest prices for goods and (bad) services, and pay even more to park there?